What Predators Eat Snapping Turtles? 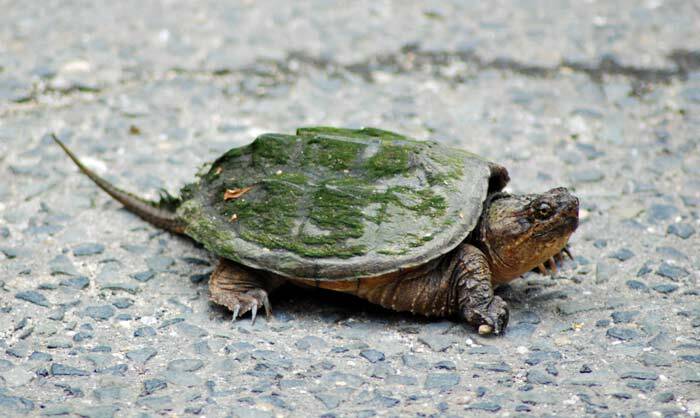 Snapping turtle hatchlings and eggs are vulnerable to many predators, including fish, other turtles, raccoons, bullfrogs, skunks, great blue herons, foxes, crows, dogs, water snakes and birds. Once the turtles are older and their shells harden, they do not face many predators. On top of predators that feed on them, snapping turtles are vulnerable to humans, especially around roadways. When snapping turtles are embarking on their terrestrial treks, they may wander onto busy roadways and can be injured or killed by motorists. Snapping turtles can also be injured from humans if they are picked up by their tails as this can injure their tail and vertebral column.